Devon Street landlord Charles Scott is unhappy over the condition of the street and repeated house burglaries. A Hartlepool housing landlord has called for action to improve a rundown street after one of his properties was broken into four times in less than a month. Charles Scott, who owns 17 houses in the town, says high crime and social problems are creating ‘no go areas’ where property values have halved and houses cannot be let. Landlord Charles Scott surveys the damage after the third break-in of the property in Devon Street, Hartlepool. He has called for more to be done to support landlords and improve Devon Street, off Oxford Road, where a large proportion of houses are boarded up or empty. Hartlepool Borough Council says a working group involving the local authority and other agencies has been set up to look at issues in the area and a masterplan is to be developed to support potential regeneration funding bids. Mr Scott owns two houses in Devon Street, one has been broken into four times in recent weeks; twice over Christmas, once earlier this month and again last week. The criminals caused an estimated £7,000 of damage by ripping out the fire, boiler and pipes causing flooding and also causing other destruction. They even stole the metal front door handle. Mr Scott said: “I have been a landlord in Hartlepool since about 2002. He said problems around social housing had reached a ‘tipping point’ adding: “The situation means there’s a drop in values,” he added. “Properties are empty and as a consequence being targeted by people who have no regard for the law. Mr Scott said the tenants in his other house in the street want to move out because of the high crime, which has seen his insurance premiums treble. He has also blamed government policies including Universal Credit which he says are hindering secure tenancies. Under the previous housing benefit tenants’ rent was received directly by landlords. But with Universal Credit, Mr Scott says tenants are more likely to get into debt and disappear, and families with more than two children are unable to claim it. Mr Scott said: “The rest of the country seems to be begging for housing, but properties in this neighbourhood can’t be let because they are derelict. Cleveland Police said they deploy resources based on threat, harm and risk combined with professional judgement and resource availability. Regarding Universal Credit, the Department for Work and Pensions said: “From February, Universal Credit will be available to all family sizes. Council chiefs say only by working together with other key stakeholders can they tackle the issues highlighted by landlord Charles Scott. A Hartlepool Borough Council spokesperson said: “We acknowledge the concerns expressed about issues affecting this area, including housing market failure, low demand for properties, crime and anti-social behaviour. 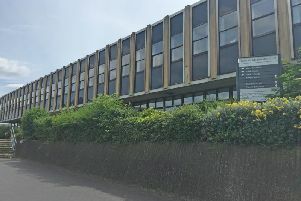 “The council cannot hope to tackle these problems on its own – and nor should they be our sole responsibility – so a working group has been set up to bring together key council officers and, crucially, representatives from other organisations with statutory responsibilities in the area and powers of intervention, including the police. “Only by working together and pooling all organisational resources will we be able to achieve the best outcome for the area and its residents. The council said while the study does not in itself represent the start of intervention, it will be of ‘vital assistance’ in supporting bids for funding should money become available nationally in the future.